Art Supplies Drive for Walnut Artists - This Friday 4-7pm ! 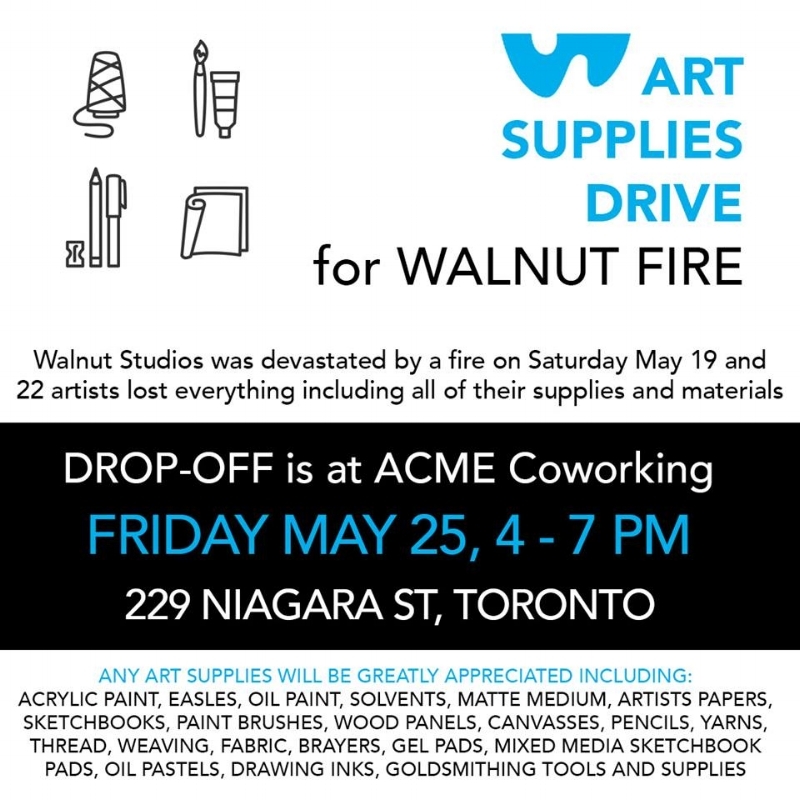 There is going to be an Art Supply Drive this Friday, May 25th to help the Walnut Studios artists who lost everything in a devastating fire this past weekend. All donations are appreciated, as even studios located at the opposite end of the building have had extensive damage due to toxic smoke and ash resulting from the flames. The drive will take place at 229 Niagra Street, just north of King at Acme Coworking. Supplies of any and all materials are welcome as more than 20 artists have lost the contents of their studios and collected works. Additionally, a GoFundMe Campaign has been started to assist the artists, many of whom are facing a tough real-estate market in Toronto where rent prices have skyrocketed over the last 10 years. For more information about Walnut studios, their history, their artists and their community involvement initiatives, please see their Facebook Page and website.